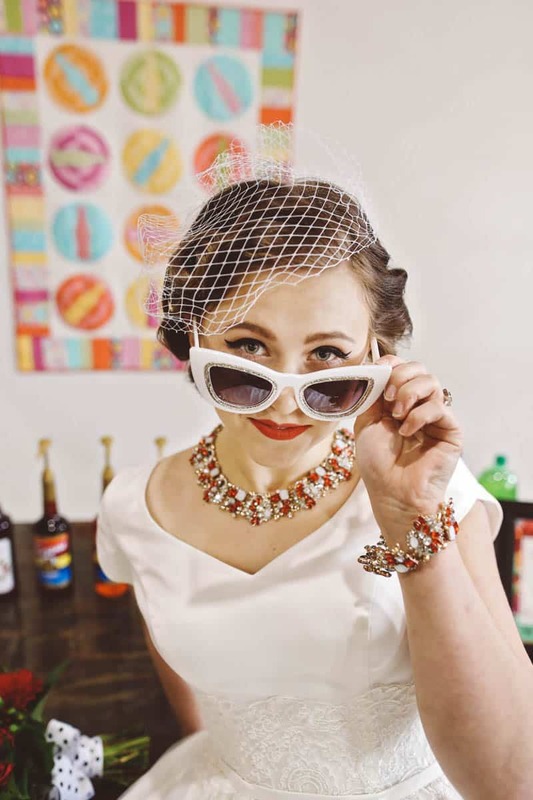 Emily White, founder of The Pear Blossom, a Utah-based wedding floral and cake studio collaborated with Ashley from Hawkeye Photography and Julie Maughan founder of Blushing Blonde Hair & Makeup Artistry to create this color-bright Retro Soda Pop Wedding inspiration! “We love how weddings are a time for families to really dive into their history and traditions. A favorite tradition for many families, and one that has spanned across the centuries, is the tradition of making and gifting quilts to the new bride and groom.” Began Emily. The shoot has lots of retro touches with a hint of whimsy. From the “Spin the Bottle” quilt pattern and brightly colored jumbo balloons decorating the soda bar to the cheerful felt ball garlands, vintage cameras and sprinkle adorned polka dot cake. The creative minds behind the shoot also chose the dress to fit the vintage vibe, a stunning tea-length dress, color pop heels, 1950’s inspired red lipstick and finger curls, and birdcage veil. This same can be said for the darling flower girls with finger-curl pigtails, polka dot skirts, bright Converse shoes, and cat eye sunglasses. How adorable are they?! “The proverbial cherry on our flirty little sprinkle cake are the bright, fresh floral bouquet and boutonnieres and seeing those same floral vibes on our retro invitation suite, complete with a darling little old-fashioned music record registry insert.” Emily added. Such a fun post thanks for sharing! I LOVE the shoot! There were three collaborators on this awesome wedding idea. It’s unfortunate the other collaborator, Julie Maughan, was not mentioned in the article. Not sure why Emily only mention her and Ashley since they work as a team. Julie was much more than a HMUA vendor. Thanks for your concern. Emily has actually been in touch and asked to have Julie included which has now been amended, so everyone has the credit they deserve for doing such a great job on a fun shoot! Agree with Pinar – loving the invitations, stunning!